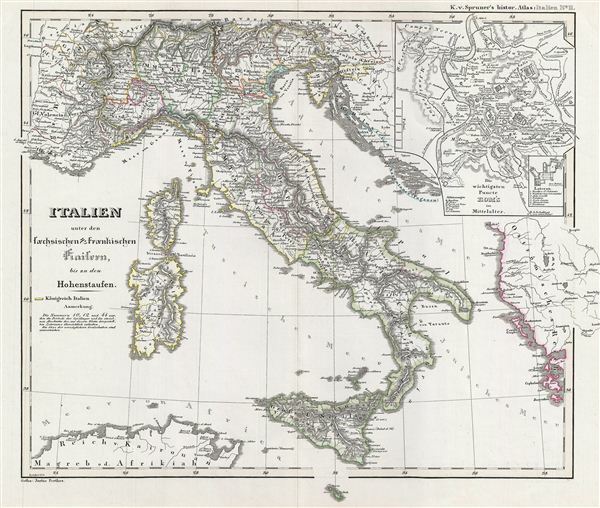 This is Karl von Spruner's 1854 historical map of Italy under the Saxon and Frankish emperor, to the rise of the Germanic Hohenstaufen Dynasty. The map covers all Italy from the Trentino-Alto Adige region to Malta and includes Corsica and Sardinia. An inset map on the top right corner details Rome during the Middle Ages. The map depicts a time when Italy was ruled by the Franks and Saxons, until, in 1194, the Hohenstaufens became Kings of Sicily. The whole is rendered in finely engraved detail exhibiting throughout the fine craftsmanship of the Perthes firm. Prepared by Karl Spruner for publication as plate It II in the second edition of Justus Perthes' 1854 Historich-Geographischer, Hand-Atlas zur Geschichte der Staaten europa's vom Anfang des Mittelalters bis auf die Neueste Zeit.